Once again, we find ourselves in that weird, disorienting place between the announcement of a new Neil Young album and a release date in the not too distant future. Such a strange, odd territory. 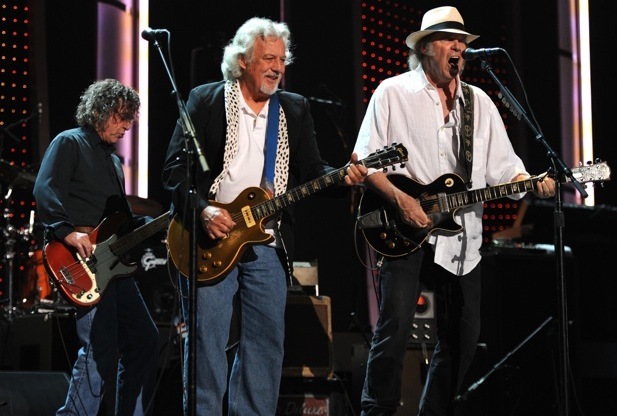 Many, many fans hail the prospects of the first full band studio collaboration between Neil Young and Crazy Horse since the 20th century release of Broken Arrow. Yet, other fans, have reservations about the reunion for a variety of reasons. Thus far tho, no one has complained that they want a solo Neil acoustic album (or a Shocking Pinks Volume #2)... yet. And as we try and balance these competing factions of opinion, we here at Thrasher's Wheat often find ourselves getting caught up in a debate that -- to us -- just doesn't seem to be necessary whatsoever. Hey, what's that sound? Look at all the faux drama going down. As lifelong fans of Neil Young, we're always waiting for the next classic 'anthem' as Ralph Molina likes to refer to them. Sometimes it takes a decade or so, but we know that he has another one in there somewhere. Beginning with Everybody Knows This Is Nowhere and 'Down By The River', Cowgirl In The Sand', and 'Cinnamon Girl', it took several years for Zuma to come along offering 'Cortez The Killer'as the next 'anthem worthy' song. Shortly thereafter came 'Like A Hurricane'. A few years later, Neil once again delivered with 'Rust Never Sleeps' which consisted of multiple 'anthem worthy' songs including 'PowderFinger' and 'Hey Hey, My My ( Into The Black). Then came Freedom with probably the most popular, radio friendly 'anthem' of all time, 'Rockin' In The Free World'. Since then, nearly 23 yrs have past and while Neil has been diligently receptive to the 'muse' whenever it calls upon him, there has not been anything as 'anthem worthy' of the aforementioned songs. While I'm certain that radio friendly, commercially successful songs would be a goal of most artists who have enjoyed the notoriety and the resulting glory that proceeds such success, it's obvious by the distinct differing personalities of each song that Neil doesn't follow a formula as such in an attempt to duplicate a follow up to any particular song just for the sake of commercial success. Most artists would be grateful to have written and recorded any one of Neil's classic recordings. Rarely does a Neil Young album consist of what would be considered as 'filler'. The only other artist that I'm aware of besides Dylan who was capable of recording a complete album of quality songs to that degree would be the Beatles, and those records were a concerted effort of four individual songwriters. Among the so called anthems, there were also 'Southern Man' and 'Ohio'. There have been several bands who came out of the chute with such great success like 'Boston, for example, that fell into the trap of capitalizing on the success of their winning formula only do succumb to an early death by not challenging their audience to accept innovation and growth. If anything was to be learned by the success of the Beatles, it was that they were constantly changing and evolving. Most bands lifespan is maybe three albums if their lucky without innovation and growth in their creative process. Most bands who have been fortunate to be accepted by their audience while duplicating their past success's are now relegated to the 'oldies circuit' of a nostalgia act. Those who are expecting a new 'anthem' on the next 'Crazy Horse' release are missing the point entirely. Whether there is another 'Cortez' or 'Rocking In The Free World' in Neil's future is irrelevant. The fact that he has evolved and hasn't adhered to a predictable 'sure thing' formula is what has kept his music fresh and keeps his audience anticipating his new releases for over 40 years. And as long as he continues following the path of his 'muse', it's almost certain that when the time is right, an 'anthem' is sure to surface once again when least expected. Thanks -- as always BIGCHIEF! Well said. It's easy to get buried in the past, when you try to make a good thing last. A crazy horse can only go so fast... like the dinosaurs in shrines. Americana... we await its arrival upon our shores. More on diehard fans stuck in the past. I totally agree with Chief on this one. I think, however, that "anthem" is a bit of a tricky word. but for every one of those, there's a "Be The Rain" or an "Ordinary People", songs that qualify in every way that I can imagine, but somehow are passed over on peoples' "greatest Neil anthems" lists, and don't really make it into the discussion. Also, other recent songs like Peaceful Valley Boulevard. Well, I guess we are talking about Crazy Horse in particular here. So, how about Change your Mind? Or dare I say it, Big Time or Loose Change? There's anthems all over the place that don't fall into the agreed upon lexicon of what constitutes a real, Neil classic. 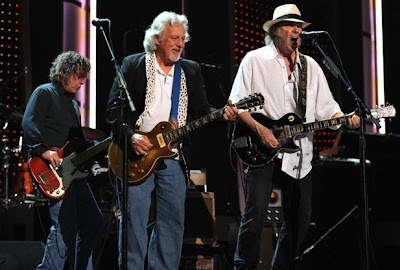 But I agree in any case, it's not the quest to make the perfect Neil Young and Crazy Horse rock anthem, it's about the evolution of the band over the years, and the evolution of Neil as a songwriter. It's all Natural Anthem. And theres No Hidden Path for Neil to Show Me the Way to that Mansion on the Hill. Of course Peace and Love live there still. Happy Easter all. Happy Easter to you too, Sony, to Thrasher and to everyone. Can't improve on anything already said here, except to emphasize Big Chiefs point that Neil does not deliver filler material. This is the first time I can recall this point being brought up in all the reading I've done over the years. Any given individual can gripe about this concept falling short of that concept, or pine for a repetition of a favorite moment, but every song has had its place even alongside the "anthems" (and I agree there are numerous of them), or acoustic mixed in with electric, or within any number of "experiments". I don't know how many ways there are to describe Neil being Neil, or how many times it needs to be said. I gave up that ghost a long time ago. I'm just grateful for whatever I get. Long may we all run looking backwards and forwards, right here in the present. It really is all one song/one anthem (I like that Thrasher). In short, it's Neil, it doesn't have to be anything else. I can't agree with the title"Diehard fans stuck in the past". This is wrong.The average fans generally are "stuck in the past". But instead only the diehard fans buy the last releases or look forward to the releases of Neil or Bob Dylan or someone else. Personally, concerning Neil, I listen only to the latest release or the Archives or some good quality "bootleg". This DIEHARD fan (fanatic) is NOT stuck in the past. I like to think about all that lies before us and how much fun we're going to have! I believe that Neil's greatest works are still ahead. Boy, that keeps me excited!!! Didn't get a chance to wish you a Happy Holiday (Passover, Easter, etc., whatever is applicable, but am doing so now. Thanks again for all the things you do to keep me so amused! I would add that Neil also creates music in which to get lost (or is it found) - music that transports you to another place or dimension. Songs as semingly incongruous as Ambulance Blues, Love and Only Love, Natural Beauty, Danger Bird, Gateway of Love and Pushed it Over the End do that for me (and there are a whole lot more of those). As for Anthems, don't leave out "Hippie Dream"! I find myself from time to time breaking the golden rule of being a Neil Young fan by placing my own expectations on what would be the ideal NY record or by beginning to think that I've discovered a 'pattern' in his mode of operation. Of course, I'm always wrong. You can't put Neil in a box and label him as predictable as most artists are. Even with the seemingly unlimited access we now have with the internet, Neil has managed to retain his 'mystique', his most valuable asset as an artist. It used to seem that he had a random approach to just write and record as dictated by his following of the 'muse', which is a word you seldom ever even heard mentioned until people started using it in an attempt to define his style or genre. He's been dealing with his fans, critics, and record company execs. for so long now that I believe it has become a game to him now. He's certainly not oblivious to our expectations and his reluctance to conform. If there ever were any theme or pattern to his creative process, it's that he intentionally doesn't want to be labeled and placed in a box limiting his options as an artist to explore whatever style of music he's feeling at any given moment. As an established artist such as Neil, it takes a great deal of confidence and risk to virtually reintroduce himself upon each new release. What we as 'long time fans' fail to acknowledge is that a new record from Neil will be somebodies first time exposure to his music and whether or not they will attempt to explore his vast body of previous recordings will be determined by their response to his latest offering. What a surprise their in for, aye? Most of his 'long time fans' are willing to write off an album or two realizing that eventually one will come along to satisfy your craving for a particular style of 'Neil'. Many people were disappointed upon the release of 'Are You Passionate' yet they purchased it for the gem 'Goin Home', the only Crazy Horse song on the record while others view that song as a distraction from the 'Booker T' style that the record was built upon. His 'moth in a lampshade' approach to constantly changing musical styles and the choice of musicians that support him is the very thing that has enabled him to remain successfully relevant with a sense of integrity with an ever evolving audience while the majority of his 'peers' from the 60's and 70's have either been forgotten or relegated to an 'oldies act', still living off the fumes of what used to be. Of course, being a genius doesn't hurt while at the same time keeping a finger on the pulse of an awareness of how he achieved such enormous success in the first place. While he may stretch the boundaries, he has a keen sense of awareness of what his audience responds to and while at times he may take them hostage as he did during the Greendale concerts, force feeding his paying audience a whole set of unfamiliar songs, he's aware of his limits and knows how to reel them back in and keep them coming back for more. Genius! Marian, Big Chief, and Andrea both brought up interesting perspectives about Neil's fans. There are fans who keep current with his work and some who drift in an out looking for that "sound" that drew them in initially. There are also fans of specific albums. There are a few buried in his past -- in love with his ghost -- trying to make a good thing last. Then there are fans like me, who want to see spiritual growth, too, which I believe happened during LaNoise. The message and music proved "Mr. Soul" was back because the spirit is what nutures the soul -- and the soul is what connects to the muse. I agree that most of Neil's best work is still ahead of him if he's open to it. Certainly after listening to that little teaser on his webpage recorded with "Crazy Horse" in January I thought "WOW!" Will this be on the new album? We have to wait and see. I don't think he's taking anyone hostage here on Americana. Clearly a true Neil fan is already on the bandwagon. I'm in a category all by myself, I guess. Thanks for not running me out of town.